We are two friends in our third year of sharing a passion for completing the circle from the care and feeding of our animals to producing fine garments traceable to each beloved beast. Every piece is a collaboration between beast and both partners, though we tend to give more credit to the beast and the partner with the original idea. 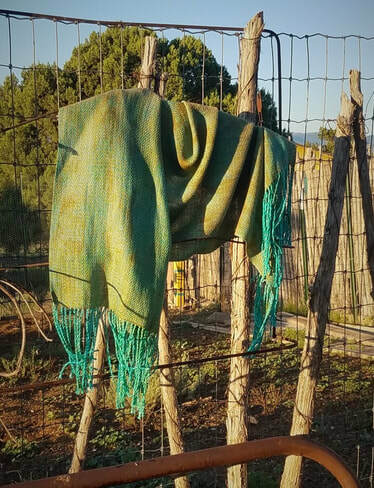 In addition, we create with cotton, linen, silks and other luxury yarns, to design and complete unique works from delicate scarves to sturdy recycled fabric rugs. Corner of hwy 48 and Smokey Bear Blvd. Cynthia and Skye will be demonstrating the spinning wheel and a small loom weaving.